The staff are currently working at New Cross Hospital based in Wolverhampton in a variety of departments including Facilities, Theatres, Primary Care, Research & Development, Women’s & Children’s Services, Rehab Ambulatory Care Group and the Patient Information Centre. The Apprentices will be studying for a Chartered Manager Degree Apprenticeship at the University which is designed for professional managers who take lead responsibility for people, projects, operations and/or services to deliver long term organisational success. Louise Nickell, Head of Education and Training at The Royal Wolverhampton NHS Trust, said: “We value every member of staff no matter what stage they are at during their professional and personal journey. We’re pleased and proud of the commitment of eleven of our employees who have signed up to study for these new Degree Apprenticeships. The University of Wolverhampton has secured an additional £460k funding to deliver training for Degree Apprenticeships to non-levy paying companies. 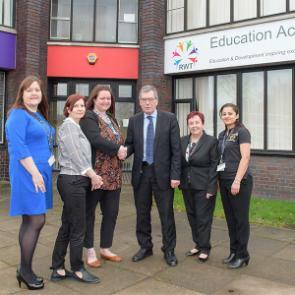 The allocation of money was approved by the Education and Skills Funding Agency (ESFA) recently and means that the University can widen its support for local businesses looking to upskill their workforce. The University offers Higher and Degree Apprenticeships in Chartered Management (CMDA), Higher Apprenticeship in Construction Management with pathways for Civil Engineering & Built Environment, Chartered Surveying, Chartered Legal Executive, Nursing Associate, Manufacturing Engineering, Product Design & Engineer and Healthcare Science Practitioner Degree Apprenticeships. Employers interested in knowing more about Degree Apprenticeships should contact the Apprentice Hub for more information. Picture caption (top) from left to right: Claire Young (Corporate Learning & Development Manager - The Royal Wolverhampton NHS Trust), Eleanor Morris (Lead for Volunteering, Engagement & Patient Experience at The Royal Wolverhampton NHS Trust and Degree Apprentice), Laura Harper (Vertical Integration Project Manager at The Royal Wolverhampton NHS Trust and Degree Apprentice), David Loughton CBE (Chief Executive - The Royal Wolverhampton NHS Trust), Louise Nickell (Head of Education and Training at The Royal Wolverhampton NHS Trust) and Parveen Kumar (Work Based Learning Manager at The Royal Wolverhampton NHS Trust). 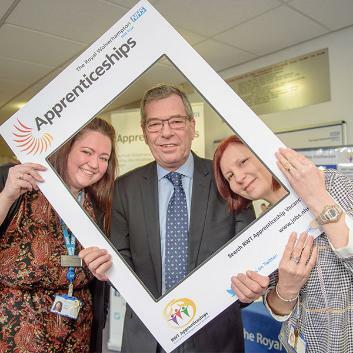 Picture caption (bottom) from left to right: Laura Harper (Degree Apprentice), David Loughton (Chief Executive - The Royal Wolverhampton NHS Trust) and Eleanor Morris (Degree Apprentice).